When we think of going local, we generally think of doing stuff, buying stuff, close to home. But that isn't necessarily the case; well, not in my case, anyway. 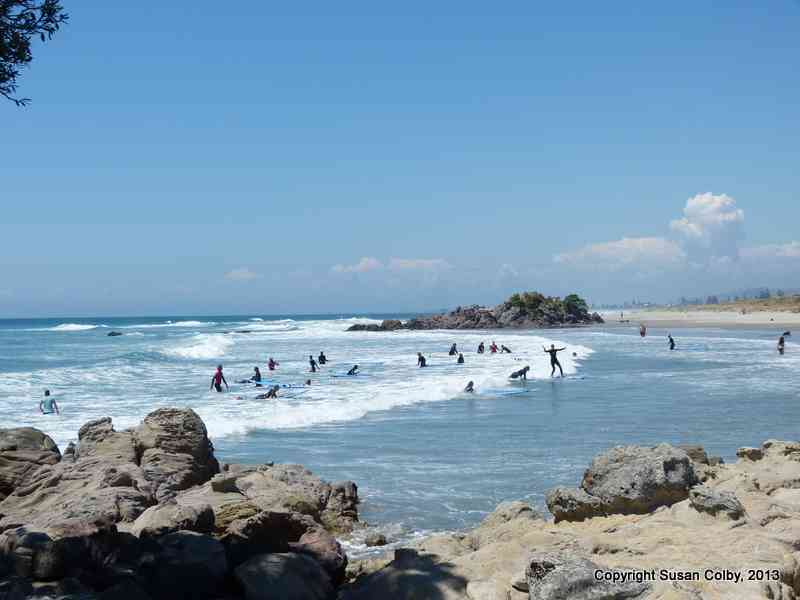 My current local is The Bay of Plenty on New Zealand's North Island, near the city of Tauranga on the east coast. I'm here visiting family, the main purpose of my stay. So we are not keen to be traipsing all over hell and gone, doing and seeing. Budget constraints are keeping us close to home, but we haven't found that to be a detriment. In fact, it adds to the adventure, as we sometimes have to dig a little deeper than published activity brochures! From the start of my visit, we have stayed local, discovering, and in some cases, depending who is with me and my sister, re-discovering the sights and attractions that are close by. Our first trip was simply to the beach at The Mount, or Mount Maunganui, a small town with an old, volcanic mountain that guards the point. As it's a very popular place to visit, with not a lot parking, we took the bus which dropped us right at the base of The Mount. There's a popular walking trail around the mountain and a steep one to the top, neither of which was on our agenda. I was more interested in walking on the beach and enjoying the waves, which were pretty small, with no surfers out, except for a whole flock of them at a surf school, learning to ride on foam boards. It's a pretty bay, with a small spit of land that becomes an island called Leisure Island, or Moturiki, at high tide. Back in the 60s, apparently Marineland built an amusement park on the island and in 1981 it was rebuilt to include a saltwater swimming pools, bumper boats and a hydro slide! In 1990 the park was removed and now it is a lovely reserve, with an easy walking trail to the top, where the views are amazing. Still being a little jet-lagged, we popped in for breakfast at the Deckchair Cafe, one of the many cafe's that line the strand. It was wonderful to sit under the umbrellas, drinking good coffee and watching the human traffic wandering along the sidewalk. Know what? There are strange shapes all over the world! Because I had just arrived from the Northern Hemisphere and relatively cold weather, I felt like I was the palest person around. The locals are all nicely tanned, lots of young (and not so young) women in mini skirts or shorts and the men in shorts too, everyone in sandals or Jandals as they call flip flops here! The UV here is extremely strong and the smell of sunscreen permeated the air. I was just hoping for a mild tan, instead of being neon, glow in the dark white! Our return bus dropped us off just down the road from home, making it a very pleasant, interesting and scenic outing, one of many to come, by going local in New Zealand.